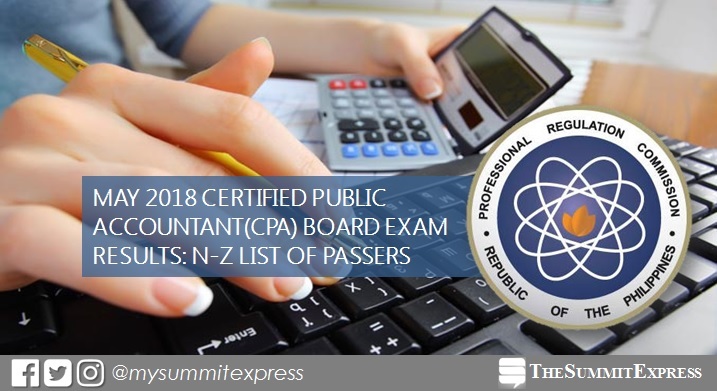 MANILA, Philippines – The May 2018 CPA board exam results are out online on Monday, May 28 or in five (5) working days after the last day of grueling exam. The Professional Regulation Commission (PRC) finally announces the complete list of passers, 2,843 (28.92%) out of 9,830 aspiring accountants, the topnotchers (top 10), top performing schools and performance of schools. Examination was administered on May 13, 20 and 21, 2018 in the cities of Manila, Baguio, Cagayan de Oro, Cebu, Davao, Iloilo, Legaspi and Tacloban. The second day of exam, originally scheduled on May 14, was moved to the 20th due to the Barangay and Sangguniang Kabataan Elections. PRC was expected to release results last Friday but a memorandum was announced by the Chairman of the PRC Board of Accountancy to extend the target date of release "to provide more time for the new examiners (there were three new appointments) to learn the policy and procedures for the deliberation." "The Board is unanimously recommending the extension of the date of the results of May 2018 CPA board examination from May 25 to May 28," the memorandum addressed by PRC BoA Chairman Joel L. Tan-Torres to PRC Commissioner Yolanda D. Reyes stated. From June 4 to June 11, 2018, registration for the issuance of Professional Identification Card (ID) and Certificate of Registration will be done on-line. Please go to www.prc.gov.ph and follow instructions for initial registration.